Two doctors’ surgeries in Brighton, which have merged, have been assured that health chiefs will support their new building. St Peter’s Medical Centre, in Oxford Street, and North Laine Medical Centre, in Gloucester Street, Brighton, merged on Friday 30 November. They are waiting for confirmation of £1.24 million funding for a new surgery building from the NHS Estate and Technology Transformation Fund (ETTF). The money will provide a cash injection to Medical Centre Developments, the premises owner, which is building the larger surgery in two phases on the car park and then replacing the current building. 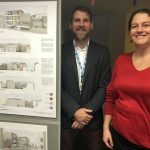 Health chiefs were told that this approach meant that the newly merged surgery and ultimately Brighton and Hove Clinical Commissioning Group (CCG) would end have less to pay back in rent. Currently the two surgeries serve 16,000 people and work out of the existing St Peter’s Medical Centre building in Oxford Street, with admin staff working from rented office space at nearby Citibase. The merger happened more quickly than planned as the North Laine surgery’s 20-year lease ended in August and it was granted just a three-month extension. Using all the rooms in the Oxford Street surgery was described as “unsustainable” by Sally Smith, the CCG’s director of primary and community care, at a meeting of the CCG’s Primary Care Commissioning Committee on Tuesday (11 December). Jimmy Burke, a senior manager in primary care commissioning, told the committee that the practices wanted a “letter of comfort” to say that the CCG would support the surgery’s move even if it did not receive the ETTF money. The meeting was told that the ETTF scheme was still uncertain as neither the outline business case nor the full business case had been signed off. Malcolm Dennett, a lay member of the committee, said: “We should be doing everything to make sure it does not fail. This must succeed. They just want a bit of assurance. A report before the committee said that the CCG could afford the new scheme without the extra cash. In June the committee agreed to support the merger with £492,000 of funding over three years. Brighton and Hove City Council has approved a proposal by Medical Centre Developments, which owns the St Peter’s Medical Centre premises, to buy a long lease on the Oxford Street car park to redevelop and expand the existing health centre that adjoins the site. With the funding, the new surgery will pay £235,000 plus VAT rent a year, or £282,000. At the committee this was described as expensive, working out at £182 per square metre plus £562.50 per space for car parking, which was described as expensive. Without the initial funding, the medical practice and ultimately the CCG would have to pay more rent to the developer – £315,000 plus VAT a year, making £378,000. This would make £242.50 per square metre plus £750 per parking space. Dr Charles Turton, who chairs the committee, said “An unfortunate number of dominoes fall down and turn to dust if this does not happen. Two public consultation events are due to take place in the reception area at the medical centre from 1pm to 2pm and 6pm to 8pm today (Thursday 13 December).